The engineering behind Subaru vehicles is renowned throughout the world, so it only makes sense to use the best parts. Genuine Subaru parts and accessories not only meet or exceed the requirements of Subaru engineers, they are also a great way to improve performance, versatility, and value. Before making the short drive from Portland, OR, check out the Carr Subaru parts department inventory online. In fact, it's easy to order genuine Subaru parts and accessories online or by phone at (888) 627-4707. There are many of us here in the Portland Area that find a particular sense of satisfaction in spending a weekend in the garage getting a Subaru dialed in just right for anything the Pacific Northwest may offer. These are people who will tell you that the parts department at Carr Subaru is the place for Genuine Subaru parts and accessories. Subaru vehicles are perfect for exploring the great Pacific Northwest, no matter what the season is. Just as it is important for ourselves to be well prepared for excursions, it is also important to ensure that the Subaru is also ready. Look though the wide range of Subaru accessories and see if one of the various cargo-related accessories may prove useful in taking all of the necessary gear along for the trip. Whether it be a handy cargo net for the back that keeps loose items from bouncing around to trailer and roof mounted cargo options, the Carr Subaru parts department has what you need. Quality accessories like all-weather floor mats and splash guards are ideal for making sure that the adventure doesn't embed itself in your Subaru. Of course, genuine Subaru parts are necessary for repair and replacement; but they are also ideal for improving your already impressive Subaru vehicle. The STI badge carries a lot of weight, from the competitive ranks of the WRC to streets and back-roads across the globe. With STI performance parts from the Carr Subaru parts department, your Subaru can benefit from this renowned capability. 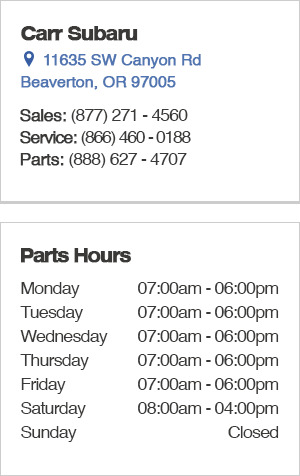 You can easily order these parts online or give us a call and chat with a knowledgeable parts consultant. We also regularly update specials on a wide range of genuine Subaru parts for common maintenance and repair needs. Take advantage of these specials to save on everything from accessories to oil changes and so much more. These specials are just another reason that no one does Carr Care like Carr Subaru, proudly serving residents from Oregon City, OR. The parts professionals at America's largest Subaru parts department at Carr Subaru are among the best in the business, so there is no concern of getting back to the garage only to realize that you were sold the wrong part. When handling such advanced engineering as that found on Subaru vehicles, sometimes it just makes sense to let the experienced factory trained professionals in the service department take care of Subaru repair and maintenance. Other times it makes sense to finally upgrade to a new Subaru and take advantage of a vehicle that has been recognized by Kelley Blue Book among the lowest 5-year cost to own. Not only does Carr Subaru have a huge selection of new Subaru vehicles, but we also offer a wide variety of quality used and certified pre-owned vehicles to choose from. Find the parts you need and order them conveniently online or by phone and discover the advantage of doing your Carr business at Carr Subaru, serving Portland, Beaverton, Hillsboro, and West Linn. Come find us at 11635 SW Canyon Rd, Beaverton, OR 97005.